The word 'philosophy' as well as the conjuring expression 'Indian philosophy' has meant different things to different people - endeavours and activities, old and new, grave and frivolous, edifying and banal, esoteric and exoteric. In this book, the author has chosen deliberately a very dominant trend of the classical (Sanskrit) philosophical literature as his subject of study. The age of the material used here demands both philological scholarship and philosophical amplification. 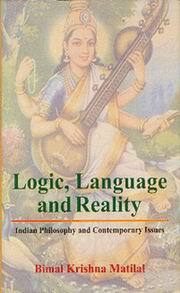 Classical pramanasastras usually deal with the theory of knowledge, the nature of inference and language, and the related questions of ontology and semantics. Several important concepts and theories have been singled out for critical analysis and clarification in modern terms, so that the results may be intelligible to modern students of both Sanskrit and philosophy. It is hoped that such attempt will kindle the enthusiasm of young scholars in the field and inspire them to proceed in this comparatively new area of research and explore into further and more interesting possibilities.